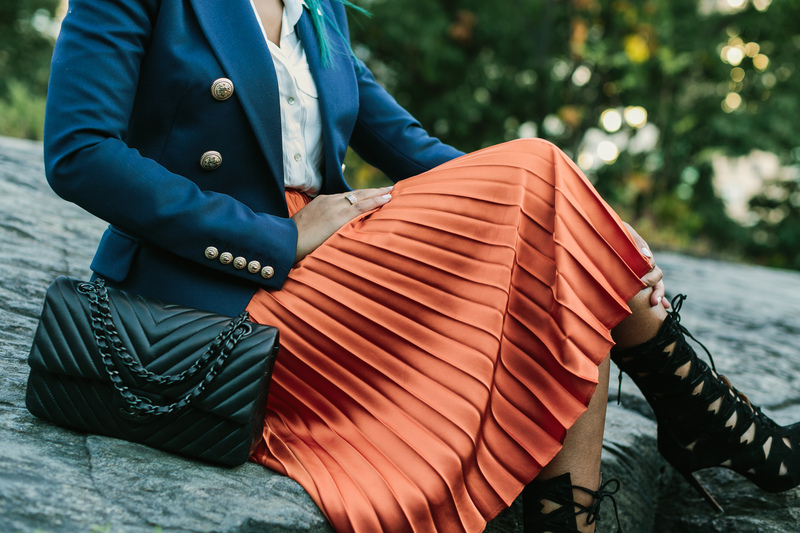 It’s no secret that I love midi skirts for any season, but especially for the fall/winter months. The pleated textures and flowy silhouettes are one of the many reasons why my TOPSHOP satin crepe pleat midi may actually be one of my favorites…. Just imagine if this were your prep school uniform, pretty cool right? Unfortunately I may be too old for the prep school talk but my BALMAIN structured blazer is fitting for the part. This Balmain blazer is an iconic investment. Sharp lapels and bold shoulders add a streamlined finish to any ensemble. Whether worn with a skirt, your favorite pair of skinny jeans or even a comfortable pair of shorts for the summer months, you are guaranteed to pull off a tailored look. 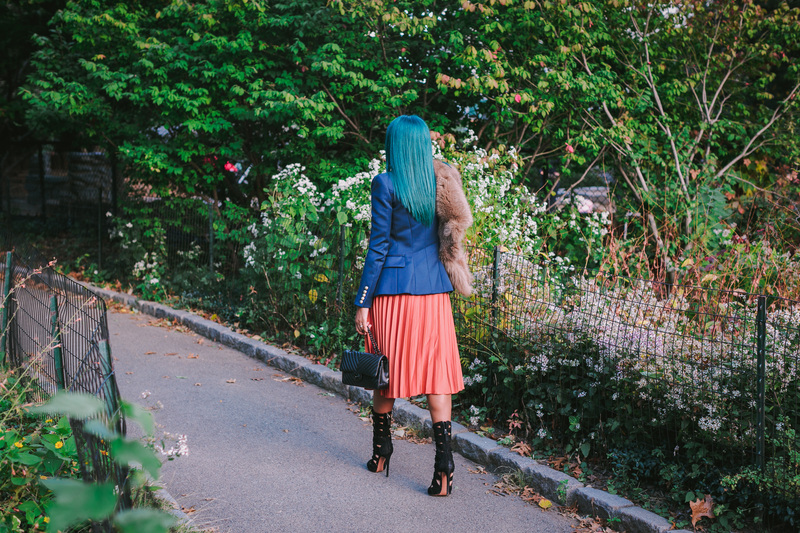 This particular day it was bit chiller in NYC than I expected it to be, so I decided to unbutton the fur collar from my trench coat and drape it over my blazer. Though it was not an actual stole, it served it’s purpose. Still in the preparatory spirit, ditching the backpack and substituting with my classic so black Chanel chevron purse. I just love this Chanel purse. At times I drop the chain to wear as a crossbody , but for today I decided to tuck the chains in a bit and wear it more as a clutch. 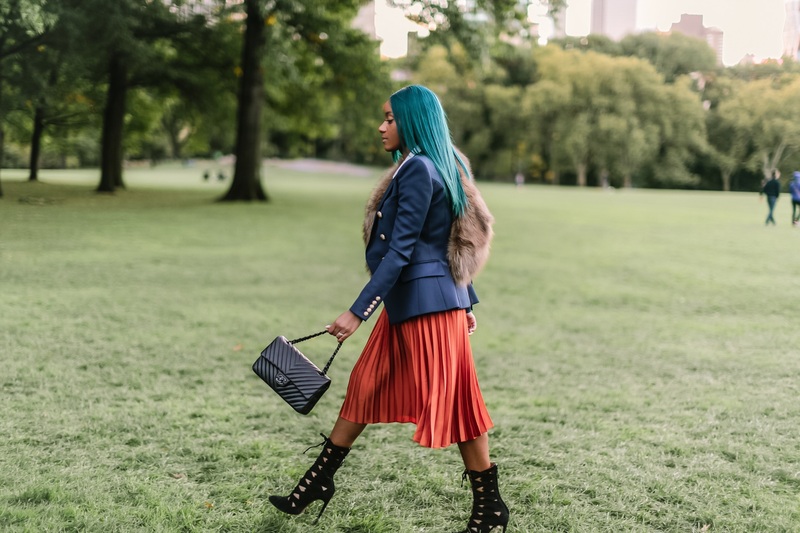 I chose to wear my ALAIA cut out boots to add a little height to a traditional prep look instead of a usual loafer, an give a more grown up feel. Cutout boots like these I feel work best with dresses and skirts, though they can be worn with a skinny or tapered pant. The striking lace-up front alongside this midi skirt creates the perfect balance between an edgy and chic. When wanting to go for a more off-beat cool look I easily pair my skirt with an oversized knit and trainers.